I would think that many, especially the young, would be dizzy with excitement in the ‘new’ Burma/Myanmar. After decades of censorship, harassment and jailings, writers are able to write and read in public. Burmese authors are being published in the country. The daily press is able to pursue stories as they see fit. It’s not perfect by any means but it sure looks fun. Better than being arrested for writing a Valentine’s day poem, as Saw Wei was in 2008. Last week actually saw a literary festival in Rangoon with some 80 indigenous writers participating, as well as international stars such as Jung Chang of China whose “Wild Swans” has just been published in Myanmar though it is still banned in China. Associated Press is beginning a year-long series about change in Myanmar. The first article is about the lifting of censorship and how some writers are responding. Sessions at the Irrawaddy literary festival, which ended on Sunday, were held in Burmese and English and varied from workshops on photojournalism and discussions on censorship and violence to poetry readings and film screenings. Audience members stood up to share their tales of being political prisoners under Burma’s five-decade long military regime, or to ask questions on how their country could gain greater literary clout. Tents selling secondhand books spilled onto the lawns of the Inya Lake hotel, which was hosting the festival, while poets and writers crowded around picnic tables discussing art and literature. 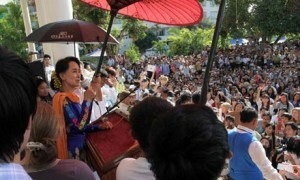 The three-day festival’s most popular talks invariably involved the opposition leader and Nobel laureate Aung San Suu Kyi — who acted as patron of the festival — during which she told sell-out audiences that books helped stave off loneliness while living for nearly 20 years under house arrest, and joked that however courageous she might seem to others, she would never be brave enough do what Harry Potter had done.